A note about the poster: Included above are a pair of images that provide a great deal of insight into how the studios developed posters for their films. These are both studio publicity stills shot specifically for this film, passed along to the art department for use in the poster. 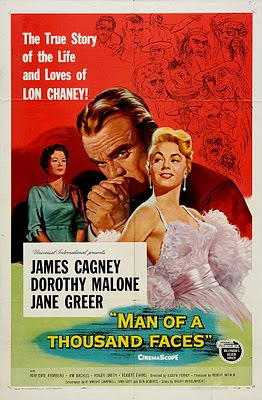 James Cagney is Oscar-worthy as Lon Chaney in 1957’s glossy Man of a Thousand Faces. 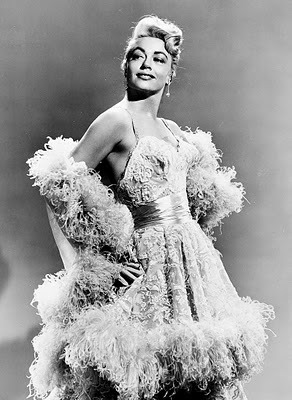 And for that matter, so is Dorothy Malone — so good here that she made me want to throw a brick through my television. More on that shortly. Cagney is one of the few performers who, no matter how much praise he receives, never gets his full due. Why? No one seems to have the guts to say he was the best that ever stood in front of a camera. As hard as it is to make such a claim of any performer, especially a crazy little Irishman like Cagney, his memory begs one to try. (For that matter, so does Lon Chaney’s — but that great actor, who unfortunately falls on the wrong side of the line in my shallow mind that divides the silents and the talkies, will have to forgive me for favoring Cagney.) It’s too easy to dismiss an actor like Cagney as a “movie star” instead of an actor — people do it to Mitchum all the time. There’s no label, no matter how lofty, that can sum up Cagney’s position in movie history. He could do it all: action, drama, romance, comedy — any damn thing, even Shakespeare. He came up in Hollywood as a scene-stealer; his charisma was undeniable. And as everyone knows, he could even sing and dance, winning the 1941 Academy Award for Yankee Doodle Dandy. His contemporaries on the Warner’s lot in the early days were Paul Muni and Edward G. Robinson, with Bogart coming on toward the end of the thirties. Yet Cagney was able to separate himself from his peers through his versatility. Muni got in his own way too often, though he had a run through the thirties as the star of big budget biopics that is practically unmatchable. Bogart’s screen presence was on par with Cagney’s, though no one would argue that his range was as broad. And then there’s Robinson: the professional, the actor’s actor. Even he admired Cagney a great deal, and lived out his life in perpetual amazement that the little Irish gentile had gotten his start in Yiddish theater. No matter where you’d place Cagney in the grand scheme of things, his depth and range are undeniable. I like this film, it has echoes of art mirroring life — that is, if we accept the truth of Chaney’s life as presented on screen — always risky. It was fitting to cast Cagney as the silent star. 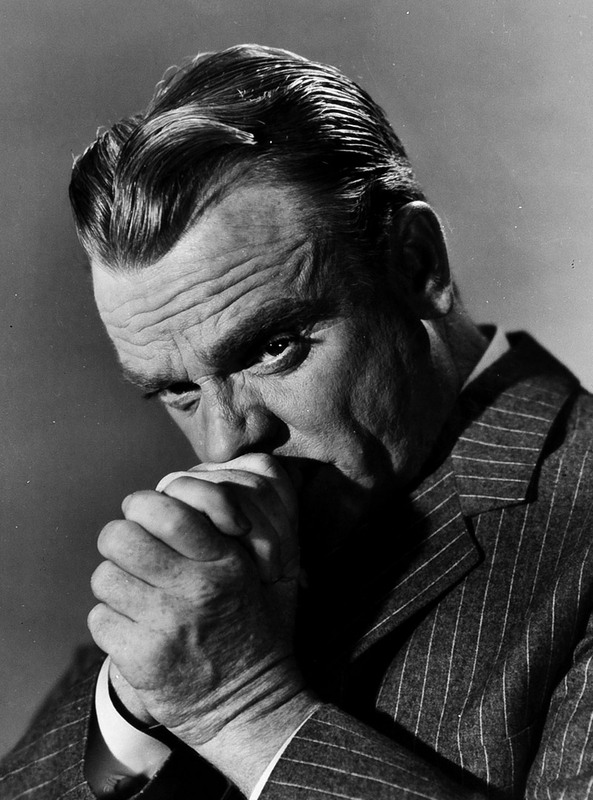 Both men were versatile as hell, admittedly in very different ways, but it comes through loud and clear in his performance that Cagney, whose career was winding down in 1957, deeply understood the man whose life he was trying to interpret for the ages. The most superficial reason to watch this is to see Cagney in all of Chaney’s famous get-ups: particularly Quasimodo and the Phantom of the Opera. As far as the movie-in-a-movie stuff goes one scene stands out: as early on Cagney is called upon to do a scene as a crippled man who is miraculously healed by a traveling preacher. He throws away his crutches and slowly, agonizingly, unfolds and articulates his limbs — transforming himself from a misshapen grotesque to a normal man in excruciating slow motion. It’s impressive in two ways: not only does Cagney have to mange the physical torture of the amazing slow motion contortions of his frame, he also has to make it look like it did when Chaney did it. The scene is riveting and unforgettable. The industry stuff aside, this is a film that at its heart is really about fathers and sons and what it means to be different. Chaney’s parents were deaf, and sign language was the primary form of communication in his boyhood home. 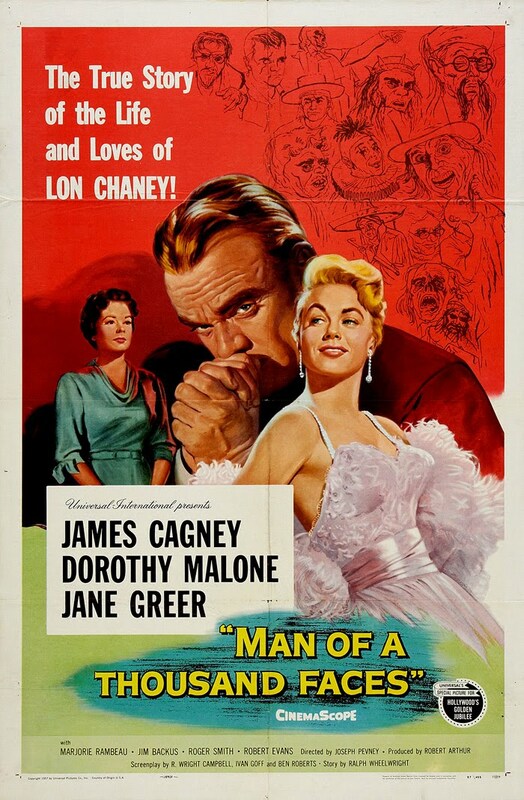 As the film opens, we discover Chaney and his young wife Cleva (Dorothy Malone, a film noir honey mostly remembered for the long-lived TV version of Peyton Place.) trying to make a go of it in Vaudeville. The problem in their marriage, which surfaces after Cleva divulges that she’s pregnant and consequently thinks the time has come to meet Lon’s family, is that Chaney never told his young wife about his parent’s deafness. To put it lightly, Cleva does not respond well when she finally meets the parents — she flees to her room and then confesses to Chaney that she no longer wants to have her baby, for fear it will be a “freak” like her in-laws. Malone is incredible here; she really lays it all out. As a parent of small children, I found her to be so despicable and infuriating that I had to turn the film off for a little while to get a breather — I recognized that I needed a break when I caught myself screaming at the television. Eventually Cleva delivers their son, who hears perfectly well, but by then the marriage is skidding. Cleva eventually becomes unhinged (in one particularly eye-opening scene!) and the marriage fails. Without giving too much away, the majority of the story is concerned with Chaney’s devotion to rearing his son; and how his Hollywood career develops as a result of his efforts to simply keep food on the table. (The son, Creighton, of course goes on to be known as Lon Chaney Junior, the the movie doesn’t tell that tale.) The whole thing goes easy on the sugar, and subsequently comes across nicely. There’s a lot to like here — I was engrossed from start to finish, bet you would be too. Starring James Cagney, Dorothy Malone, Jane Greer, and Jim Backus. I'm just catching up with your reviews on this site--after devotedly reading your posts on Where Danger Lives, these non-noir comments are very enjoyable. I loved your assessment of Cagney. He is in a class by himself--so compelling and able to touch, entertain, and frighten a viewer with his ferocious talent. I wish that more was written about former actor Joe Pevney's films as an actor (Body and Soul, Thieves Highway) as well as those he directed, such as this film, and his pulpier ones, (Female on the Beach, Istanbul, The Crowded Sky). Thanks for writing this and making me want to see this again. Thanks Moira, sorry for the delay in getting to your comment. I've been sucked into a holiday vortex over here. I've seen neither Istanbul nor The Crowded Sky - I need to catch up on Pevney!